allows for their survival and reproduction in various areas on the rockplatform ecosystem. These areas are influenced by predictable phenomena such as tides, day and night as well as seasons. We provide scientific equiptment to measure various abiotic aspects of the rockplatform ecosystem including temperature and salinity and look at how organisms have adapted to survive in these changing conditions. We also classify one producer and one consumer and study the structures and functions of these living things as well as constructing a food web. Students examine how the structure and function of living things allows for their survival and reproduction in the mangrove and sea grass ecosystems. These areas are influenced by predictable phenomena such as tides, day and night as well as seasons. We provide scientific equiptment to measure various abiotic aspects of the ecosystems including temperature and salinity. A plant from each ecosystem is studied in detail with the help of field microscopes to look at how these organisms have adapted to survive in these changing conditions. We also classify one consumer the students catch themselved in the sea grass and study the structures and functions of this organism in detail. At the end of that day we construct a food web based on the plants and animals we have observed throughout the day. Students will examine abiotic and biotic components of the environment and compare two plant communities by identifying trees, measuring soil moisture and foliage cover. This information is used to consider how the structure and function of the tree is related to their survival and reproduction. 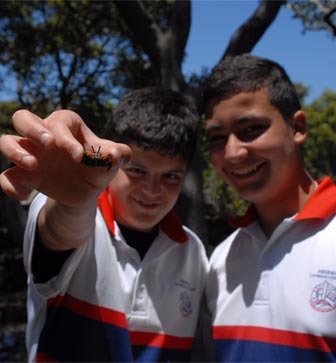 We then study the freshwater creek environment, collecting animals independently to construct a food web. Hopefully we catch a cray fish to look at in detail, classifying it using a hierarchical key as well as observing structural features. Students will examine plants in the open forest and the rainforest, looking at their adaptations and the environmental conditions found in each location, including soil moisture and foliage cover. This information is used to consider how the structure and function of the tree is related to their survival and reproduction. We then construct a food web after collecting rainforest animals independently. We will study one organism in detail including classifying it using a hierarchical key.